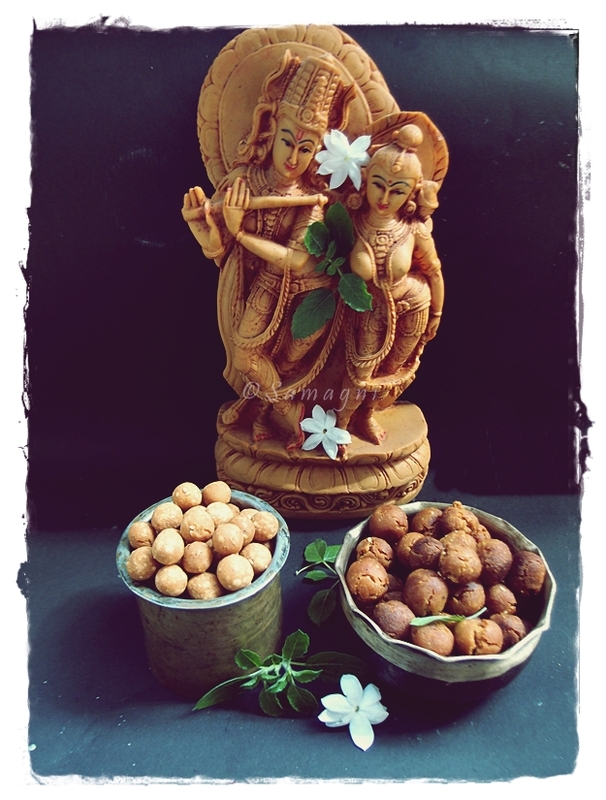 Seedai / Cheedai is made during Gokulashtami as a Naivedyam to Lord Krishna. Apart from festival celebrations, it is associated with a lot of fond memories for me. It is one of my favorite savory items. Hard yet crunchy, peppery along with the taste of cumin seed and a hint of hing and coconut. Well worth the effort. Amma often makes it at home. Since it is time consuming to shape the cheedai into balls, she always makes it when all of us are available to help. Even grandma used to join. But today I made this all by myself and it was not tough at all to make cheedai with two cups of rice flour. I could manage time very well by simultaneously frying as well as rolling the dough. Although cheedai is easy to make, it is also slightly tricky because if you do not do things the right way, the chances are more that you will not get it right or something might go seriously wrong, for example, cheedai bursting inside the hot oil and causing oil splash. For this reason, one needs to be really careful while attempting to make this. Grind the grated coconut along with the jeera and black peppercorns to make a coarse paste. You may add small quantities of water. Mix a tablespoon of sieved, finely powdered urad dal flour along with the sieved rice flour. Add the ground coconut, cumin, and pepper paste into the flours, add sesame seeds, asafetida powder, salt, and butter. Use your fingers to mix the flour and powders well. Add small quantities of water to make a dough. The dough should be soft and firm but not loose. Take a small portion of the dough, place this dough on your left hand and use the long three fingers on the right hand to roll the dough into tiny marble-sized balls. Place them on a paper. It is recommended that you allow this to dry a bit before you deep fry them. Once the oil is hot, gently and carefully drop a batch of the marble-sized dough balls into the oil. Retain the fire in medium in the beginning for at least 2 mins. You will notice a lot of bubbles during this time. When the bubbles reduce, lower the fire and stir occasionally until the balls change color to golden brown. Use a strainer ladle to remove the cheedai from the oil. Place on an absorbent paper to absorb excess oil. 4. While deep frying, maintain the flame first in medium and then in low stirring occasionally. 5. Following the proportions and instructions properly is key to getting this right. Thogayals are handy chutneys/accompaniments that can be used along with rice, rotis, and even dosas and idlis. They are a good ‘chakhna’ for rice gruel/kanji also. Ridge gourd may sound like a very unusual vegetable for a chutney. But, believe me, this tastes so good and you will love it. Wash the ridge gourd thoroughly and remove the hard green skin. It is okay if small portions of the green skin remains. Cut it into long strips and then chop roughly into smaller pieces. Place an iron wok on fire and add a oil. Add urad dal, whole dry red chilies broken into pieces, and asafetida and roast in a medium flame until urad dal changes to golden color. Remove from the pan and keep aside. Add the chopped ridge gourd pieces into the same iron wok and cook for about 5 mins or so until the ridge gourd pieces turn tender and start oozing water. Turn off the fire and add the tamarind and let it soften in the remaining heat of the wok and lose it’s raw taste. Let it cool. Use a mixer grinder and pulse the dry ingredients (roasted urad dal, red chilies, asafetida, and grated coconut) first to a smooth powder. Add the sauteed ridge gourd, tamarind, and salt and grind to a smooth paste. You may not need to add water while grinding as the ridge gourd has some water content. Serve along with rice or roti. A healthy, nutritious, protein dosa made from sprouted bajra. Wash and soak bajra overnight/8 hrs. Drain the water and leave it as is for half an hour to one hour. Take a clean cotton cloth and put the bajra in this cloth and cover. Sprinkle water on this cotton cloth and ensure that it is wet. After about 12-15 hrs, you can see nice sprouts. Soak urad dal in water for about 4 hrs. Grind sprouted bajra and urad dal together to make a fine paste. Add salt and water and dilute. The batter should be of the normal dosa batter consistency. You can ferment the batter if preferred. Place the griddle on the stove. Heat griddle and pour about a full ladle of batter on to the griddle. Spread the batter around carefully using the bottom of the ladle. Cook in medium flame for about 30-40 sec. When the edges get crisp, pour 1 tsp oil, and flip over the dosa. Lower the flame and cook for around 15 seconds. Remove dosa from the girdle. Protein dosa is ready. Serve with hot sambhar or chutney. Bajra is packed with nutrients and minerals. Sprouted bajra dosa is rich in proteins and is good for the colon. This is a very good way for vegetarians to include protein in their diet. You can make this dosa without sprouting the bajra also. The taste remains more or less same, only the nutrition quotient will be less compared to the sprouted dosa. Spicy, roasted coconut chutney powder that tastes great with rice. Contains no oil. This is different from the chutney powder that is eaten with idli and dosa. * In case any of these ingredients are unavailable, check the alternate ingredients section for other options. Peppercorns and rice are optional. Those who do not prefer pepper can use red chilies alone. Heat up a pan (preferably iron). Add the urad dal and raw rice. Dry roast these two ingredients until golden brown. Constant stirring is required. Add the red chilies, black peppercorns, and the asafetida powder towards the end. If you are using asafetida chunks, you may need to add it around 5 minutes beforehand. Turn off the fire when the urad dal and rice turn golden brown. Remove the ingredients from the pan and spread on a plate to cool the ingredients. Place the pan on fire again and roast the grated coconut until golden brown. This is to remove all moisture content and improve the shelf life of the podi. Turn off the fire and empty the roasted coconut on to the plate along with the other ingredients. Put the tamarind into the pan while the pan is still hot. Do not light the fire. This will help to remove the moisture content in the tamarind. After the ingredients have cooled, grind the roasted ingredients well along with salt. Empty the ingredients onto a plate and let it cool. Taste and adjust the salt and chilly if required. Make sure that you roast the red chilies before you add it to the podi. Store the podi in a dry bottle. Enhances the taste of rice. This is like a dry pickle. Its granular texture adds punch to your lunch. This podi has a shelf life of around a month and is a good gift for those special loved ones.